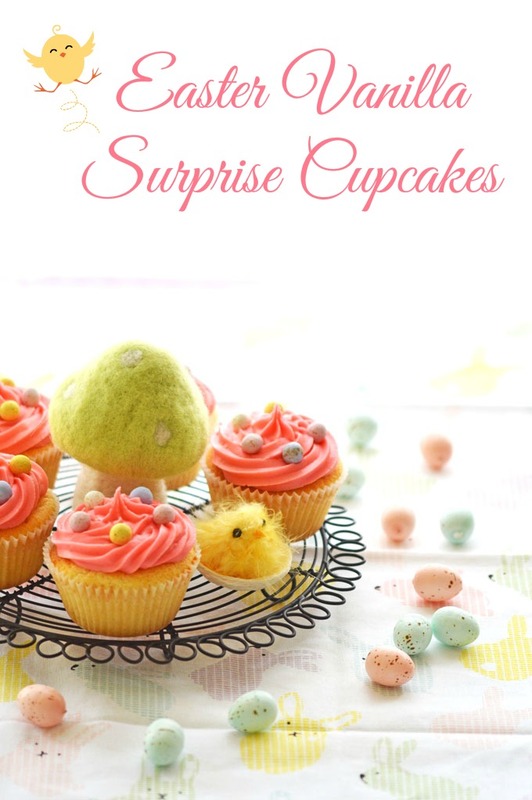 The kids were very excited to try out my Easter Vanilla Surprise Cupcakes! Preheat the oven to 190°C / 170°C fan forced. Cream together the butter and caster sugar in a large mixing bowl. Sift the SR flour and salt into the wet ingredients and mix gently while adding in the milk and vanilla essence. Once your cake mixture is combined, fill your patty pans ¾ full. If there is any mixture left over, divide up equally between the patty pans. Place a chocolate egg, standing up in each mixture and push it a little bit down. The egg needs to be covered with the mixture so you will need to use a spoon and gently lift up the mixture from the sides around the egg and spread on top. It doesn't have to be thick as the egg sinks while the cupcake is baking. Bake in the oven for 12 to 15 minutes or until the cake tester comes out clean. 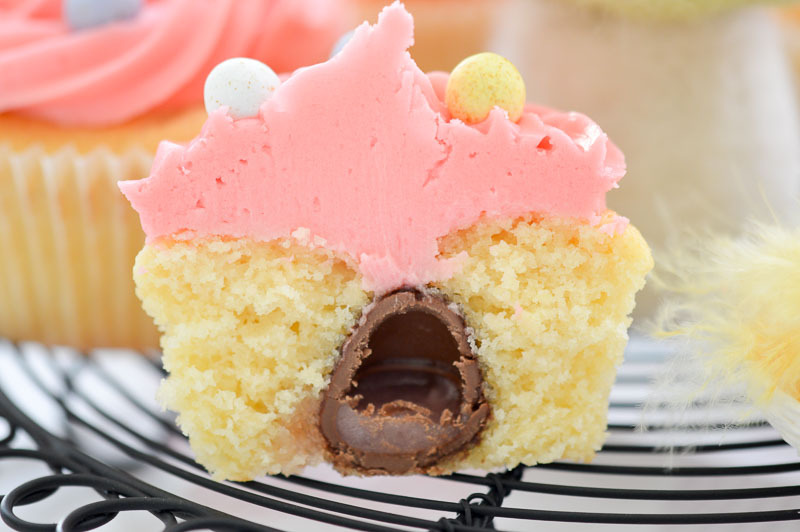 Insert the cake tester gently into the sides of the cupcake, so you don't pierce the easter egg. Remove from the oven and allow to cool for 2 minutes before removing from the muffin tray. 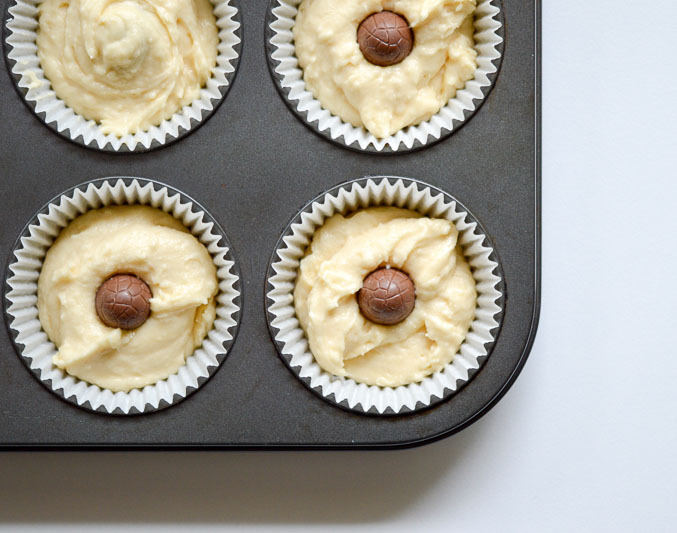 Place on a cake rack and allow the cupcakes to cool completely. 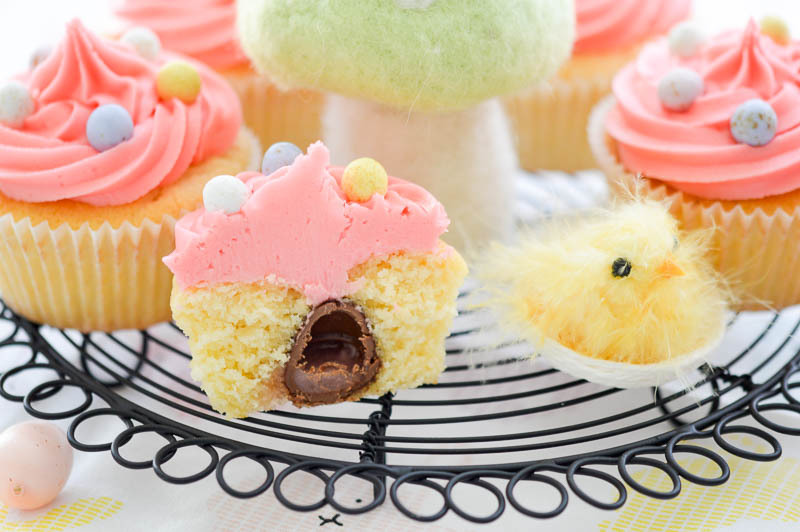 Once cooled you can then decorate them with the icing and Easter decorations. * When I make my icing I don't measure the ingredients as I work from the feel of the consistency which is why I don't have the amounts there. I have been making icing for so many years this way that each time I make it I forget to write it down. The cupcakes came out light and moist. There is a lovely blend of the vanilla and strawberry flavours coming from the essence and chocolate strawberry egg. These cupcakes have a perfect surprise in them, a little bit of strawberry sweetness. I always have so much fun decorating cupcakes. I love doing the piping. For me, it’s very relaxing, and I like to switch off from the chaos of the house and enjoy watching the icing being pushed through the piping bag and transforming into a gorgeous pattern. But if you don’t like using a piping bag you can definitely just spread the icing over the top of the cupcake with a butter knife. 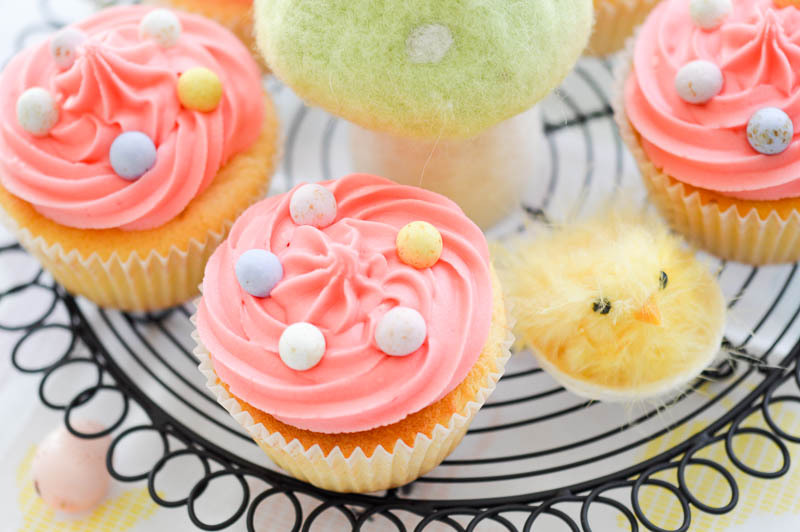 These Easter Vanilla Surprise Cupcakes were enjoyed by all and disappeared in three days. I think it’s time to make another batch! Do you like it plain or does it have to be covered in a thick layer of icing? These look so so good. Beautiful thick icing and I love the mini egg inside. Nawwww…. these are just so cute!! I love that gorgeous frosting! Surprise cupcakes are the best especially when they look as delicious and beautiful as yours Simone! My favourite cupcake flavour would have to be salted caramel but I can never go paste a good old butter cake batch, and buttercream icing is a must! Thanks for joining in the fun with us over at Fabulous Foodie Fridays! The look fantastic – must try these. Thanks for linking up to Pin Worthy Wednesday, I have pinned your post to the Pin Worthy Wednesday Pinterest Board. I am all for lots of icing and I love your surprise chocolate in the middle. 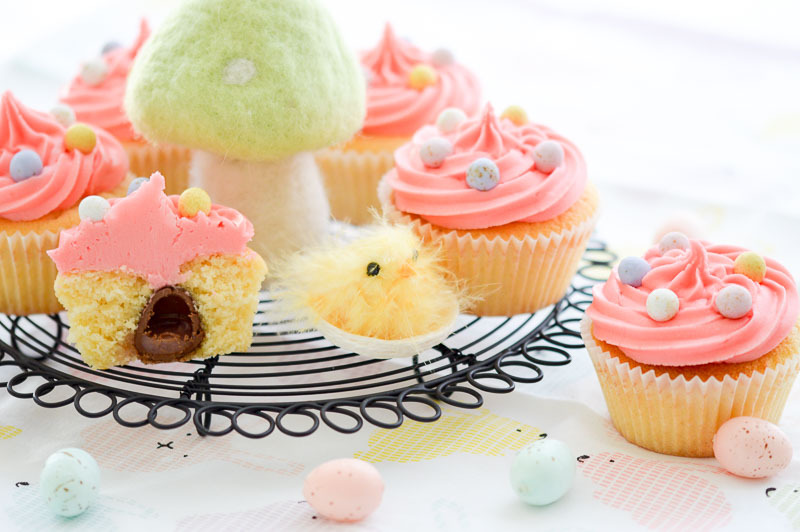 Another gorgeous Easter recipe Simone, I love them! I’m going to have to hunt down (no pun intended!) those strawberry filled easter eggs. These are absolutely eggsquisite! You are so clever and an Icing Ninja! (That’s a thing!) Now what I’d like to know is where did you get those mini mini eggs? PS. I love the styling – it’s sublime!